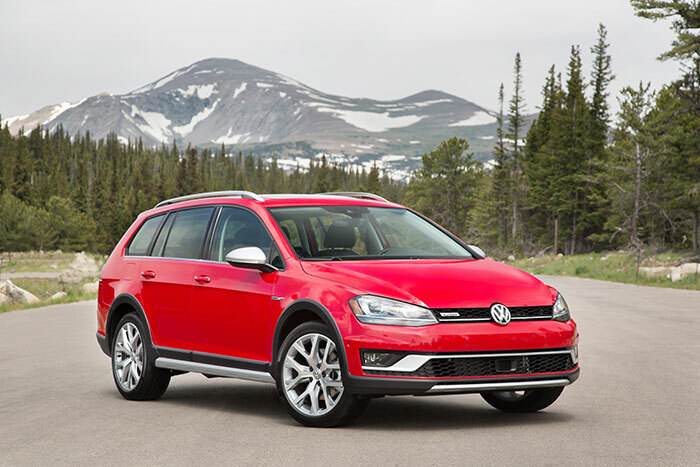 VW has announced the official pricing for the 2017 Golf Alltrack and the little all-wheel drive station wagon starts at $26,950 for the S model and runs up to $32,890 for the SEL at the top of the line. All versions get 4Motion all-wheel drive, hill descent control, and an Alltrack-exclusive off road mode. The car is designed with more ground clearance for performance on a variety of road conditions. Alltrack buyers can also opt for advanced driver assistance systems like adaptive cruise control, forward collision warning, and autonomous emergency braking. The car can also be fitted with front and rear park distance control, park steering assist, lane departure warning, and high-beam control. The Alltrack has the utility of a small SUV along with its cargo volume and roof rack with the road manners of a car. Inside the Alltrack has a standard 6.5-inch touchscreen with rear view camera that has Car-Net app-connect and available off-road HMI section. Power is from a 1.8L TSi turbo direct injected four with 170hp and 199 lb-ft of torque. To start the car will come with a 6-speed DSG dual clutch automatic with a six-speed manual version coming later. The car will hit showrooms in October.